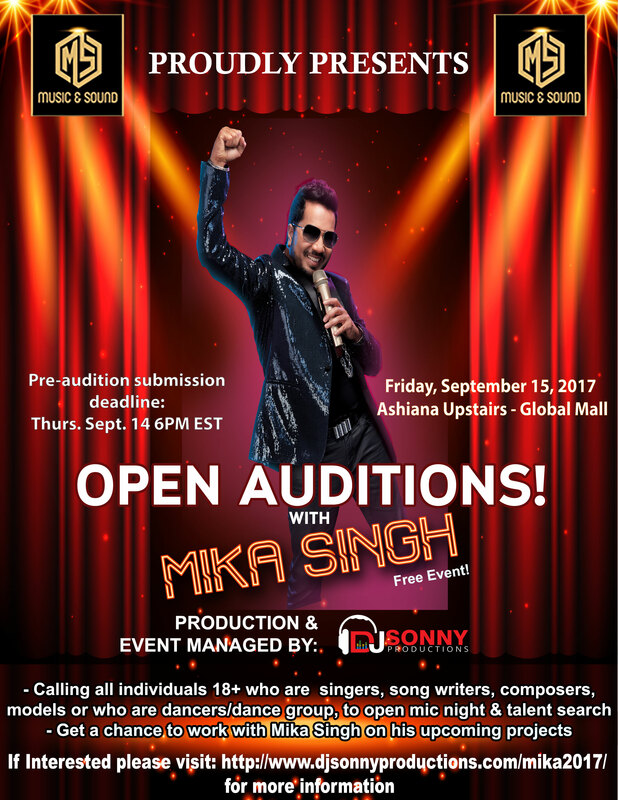 FREE Auditions to perform in front of King Mika Singh and a chance to work with Mika Singh on his upcoming projects! SERIOUS ENTRIES ONLY! Candidates over the age of 18 must submit their pictures if you are applying for model, video or audio link with picture if you are applying for a singer as well as composer and if you are applying for a dancer/dance group then submit video links with group picture via the form below by 6PM EST Thursday, September 14th, 2017. The team will review all the information, pictures and videos and will invite the top 20 candidates in each category to attend the event, at no cost. Notifications will go out via email and/or phone and the top 10 candidates from each category will be given a chance to perform in front of Mika Singh. Top 10 performers will be announced at the event. You will be provided up to two Shure wireless vocal mics, one DI/Aux connection, one XLR or 1/4 connection on the stage, if you are planning to bring any instrument. We will not provide any instruments and you will be allowed a maximum of one minute to setup. For models, we will play 15-30 seconds of walk music and allow 30 seconds of talk time to share your experience to tell him why you would want to be part of his music video and/or events. Only singers and dancers will be allowed two minutes on stage in front of Mika Singh, unless he requests additional question(s) or performance. Stage size is 24 x 16 and it is carpeted. Up to 100 spectators/audience will be allowed to watch the event on a first come first serve bases. This is totally a free event to help the Atlanta community promote local talent. The final decision of the top 10 candidates will be at the discretion of Mika Singh. At Mika Singh’s request, we will pass your contact information to him or to his production team. The main event will be held at Ashiana Banquet Hall (upstairs) at 8:30 PM. Tight security with zero tolerance policy will be enforced. DJ Sonny Productions & MS Music & Sound reserves the rights to decline any entry without any explanation. By clicking on the below send button you accept and acknowledge that you have read and understand everything on this page. DJ Sonny Productions, staff or any partners are not responsible for any expense or take any responsibility from the results that may come out of this audition now or in the future. Please participate at your own discretion.